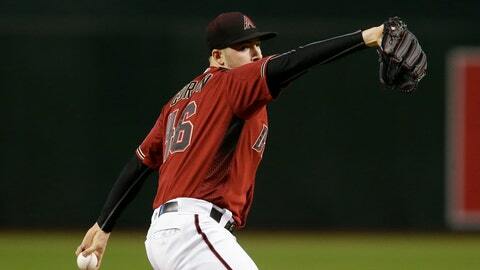 PHOENIX (AP) — Patrick Corbin got into a rhythm with catcher Alex Avila, leaving Philadelphia’s hitters flailing. Velasquez allowed two or fewer runs in his six starts heading into Wednesday’s game, with a 0.95 ERA in four July starts. The right-hander allowed two hits in 6 1/3 scoreless innings to beat the Miami Marlins in his previous start. The Diamondbacks eclipsed the two-run barrier against Velasquez in the third inning, going up 3-0 on Peralta’s two-run triple and Escobar’s sacrifice fly. Arizona added a run in the fourth inning on Jon Jay’s double play. Velasquez did not come out for the fifth after allowing four runs and six hits. “Just a terrible display of executing my secondary pitches today,” Velasquez said. Corbin isn’t the only Diamondbacks starter pitching well at the right time of the season. Arizona’s starters posted a 1.27 ERA with 20 strikeouts and a .176 batting average against in the three games against the Phillies. The Diamondbacks’ staff has allowed three or fewer runs in six straight starts since Aug. 3, their longest such streak since June 22-27, 2017. Peralta has six games of at least four hits, matching Giancarlo Stanton of the New York Yankees for most in the majors this season. … The Phillies were shut out for the eighth time this season, seventh on the road. … Escobar’s 42 doubles lead the majors. … Philadelphia’s Cesar Hernandez has hit safely in all 14 of his starts against Arizona after going 2 for 3. Diamondbacks RHP Clay Buchholz is 4-0 with a 2.17 ERA in five starts heading into Friday’s game at Cincinnati. Phillies RHP Zach Eflin will make his 2018 debut when he faces the San Diego Padres on Friday.